Doménikos Theotokópoulos (Greek: Δομήνικος Θεοτοκόπουλος [ðoˈminikos θeotoˈkopulos]; 1541 – 7 Aprile 1614), maist widely kent as El Greco, wis a penter, sculptor an airchitect o the Spaingie Renaissance. "El Greco" ("The Greek") wis a nickname,[a][b] a reference tae his Greek origin, an the airtist normally signed his pentings wi his full birth name in Greek letters, Δομήνικος Θεοτοκόπουλος (Doménikos Theotokópoulos), eften addin the wird Κρής (Krēs, "Cretan"). a. 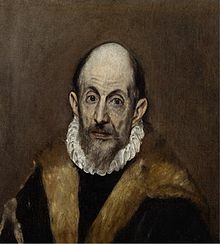 ^ Theotokópoulos acquired the name "El Greco" in Italy, whaur the custom o identifyin a man bi designatin a kintra or ceety o origin wis a common practice. The curious form o the airticle (El) mey be frae the Venetian dialect or mair likely frae the Spaingie, tho in Spaingie his name would be "El Griego". The Cretan master wis generally kent in Italy an Spain as Dominico Greco, an wis cried anly efter his daith El Greco (Spaingie pronunciation: [el greˈko]). b. ^ Accordin tae a contemporary, El Greco acquired his name, nae anly for his place o origin, but an aa for the sublimity o his airt: "Oot o the great esteem he was held in he wis cried the Greek (il Greco)" (comment o Giulio Cesare Mancini aboot El Greco in his Chronicles, which war written a few years efter El Greco's daith). ↑ "Greco, El". Encyclopædia Britannica. 2002. ↑ Cormack, R.; Vassilaki, M. (August 1, 2005). "The baptism of Christ: New light on early El Greco". Apollo. ISSN 0003-6536. Retrieved July 1, 2015 – via The Free Library. This page wis last eeditit on 24 Mairch 2017, at 04:26.